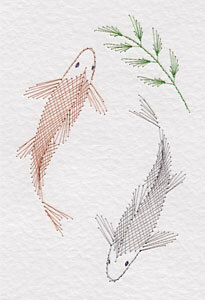 A Japanese Koi carp pattern has been added to the Stitching Cards collection. The design features two Japanese Koi fish. It makes a great birthday card for men. It can also be used for congratulations, thank you and other messages. The word koi comes from Japanese, simply meaning “carp”. Carp are a large group of fish originally found in Central Europe and Asia. The pattern size is 152 mm x 104 mm (6 x 4½ inches).